Together with Georges Kohler, Milstein developed the first unlimited supply of monoclonal antibodies, which today underpin many diagnostics and therapeutics. Milstein is the subject of an exclusive exhibition kindly supported by the Medical Research Council. Please go to this page to view the exhibition. Milstein was the middle son of three boys born to a Jewish immigrant father who came to Argentina from the Ukraine and an Argentinian mother who was the daughter of immigrants from the Ukraine. His father had started life as a farm labourer and then had become a travelling salesman, while his mother had begun her career teaching and rapidly rose to become a headmistress. During his childhood Milstein became fascinated in science when he read of the adventures in The Microbe Hunters by de Kruif and heard stories from his older cousin trying to develop a vaccine for snake venom. In 1953 Milstein married fellow chemistry graduate Celia Prilleltensky. In his early years Milstein attended schools in his hometown, Bahia Blanca, including Colegio Nacional. His last year of schooling was spent in Buenos Aires to prepare for university. Milstein completed a chemistry degree in 1952 and a biochemistry doctorate in 1958 at the University of Buenos Aires. Funding his studies by working part-time and undertaking research with only the most basic of equipment, Milstein came close to abandoning his doctorate when to his horror on making an enzyme preparation he broke three of the five expensive flasks in his department. He completed this doctorate in 1957. In 1958 Milstein was awarded a British Council fellowship to study at the University of Cambridge, which resulted in a second doctorate in biochemistry. In 1961 Milstein took up a prearranged appointment as head of a new Department of Molecular Biology at the National Institute of Microbiology in Argentina, a pioneering institue in Latin America with an infrastructure and scientific base that matched other research institutes in the United States and France. With his work in Argentina thrown into disarray by the political turmoil of a military coup in 1962 Milstein returned to Cambridge in 1963 to work in the newly established Laboratory of Molecular Biology. This move marked a shift in research from enzymes to what would become a lifelong study of the formation and diversity of antibodies. In 1983 Milstein was appointed Head of the Division of Proteins and Nucleic Acids at the Laboratory of Molecular Biology. From 1988 to 1995 Milstein was Deputy Director of the Laboratory of Molecular Biology. In 1987 Milstein was declared Honoary Citizen of the City of Bahia Blanca and received an honorary doctorate from the Universidad Nacional del Sur. Milstein was important in advancing the knowledge of antibodies, notably their structure, expression and diversity. In 1984 he was awarded a Nobel Prize for his development, with Georges Kohler, of monoclonal antibodies in 1975. Developed originally as a tool for basic research, monoclonal antibodies opened up new frontiers in diagnostics and therapeutics for over 50 major diseases. 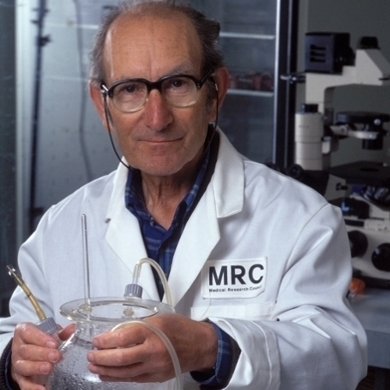 Milstein was at the forefront of showing the applications of monoclonal antibodies for automated cell fractionation, studying cell surfaces, tumours, neuropharmacology, typing blood and tissue for blood transfusion and organ transplants, and laying the groundwork for many current blockbuster drugs. Milstein is the subject of an exclusive exhibition kindly supported by the Medical Research Council. Please go to this page to view the exhibition.